Zhang Bin is a 15-year-old boy from China. 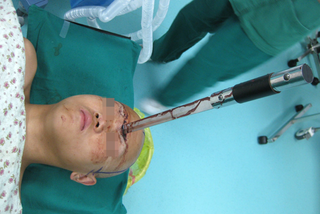 Zhang Bin can also now tell people what it feels like to have a sword embedded in your forehead and get the hospital runaround before undergoing successful surgery. "Three classmates came to visit me at home and one of them brought a sword," the teen said of the accident. "He stood 3-4m away from me. I don't know how the sword flew at me and stabbed into my head."